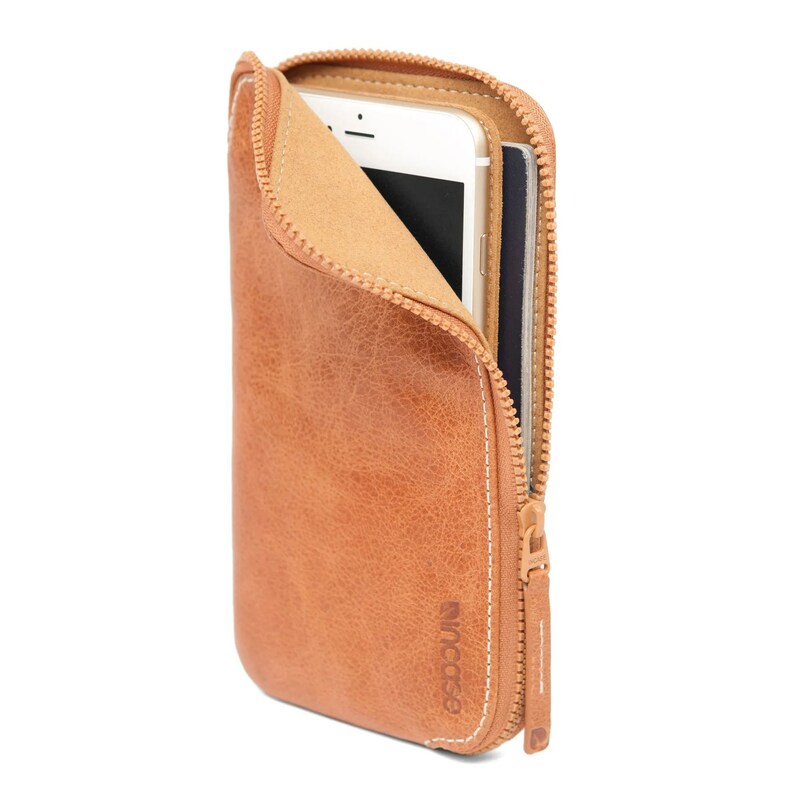 It’s hard to go wrong with a wallet case for an iPhone 6s or iPhone 6. Along with providing extra space for credit cards and cash, they all offer a nice layer of protection for your handset. Here are seven great options you’ll definitely want to look at. Designed to fit up to three credit cards and cash, CM4’s Q Card Case is a minimalistic choice. A cutout on the back allows users quick and easy access to all of the wallet’s contents. A raised bezel protects the screen from scratches when placed faced down. You can purchase a black version for $31.98. Other colors cost a bit more. A great way to keep your credit cards and cash hidden and secure, the OtterBox Commuter Series Wallet Case features a special access drawer on the rear of the case. It can hold up to three credit cards and some cash. An audible click lets your know that the items are safe. OtterBox also includes a self-adhesive screen protector. 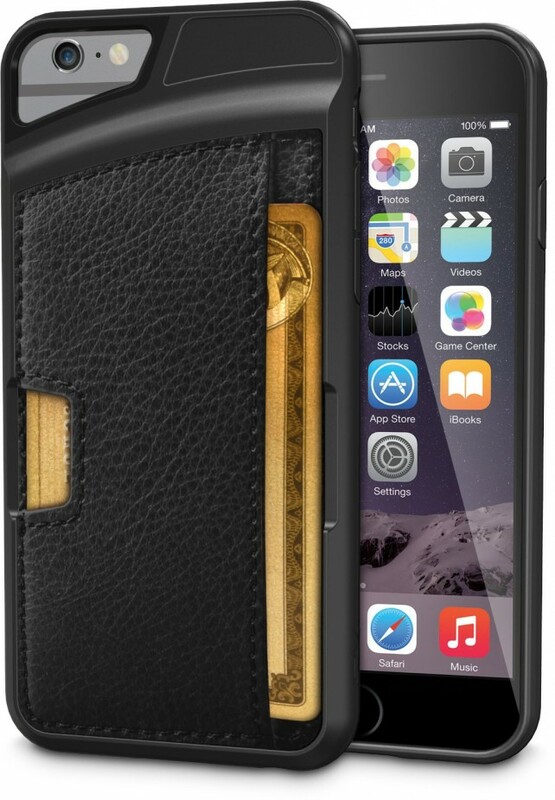 The black version of the case is $24.67. A white/gray and white/pink version are also available and cost a bit more. 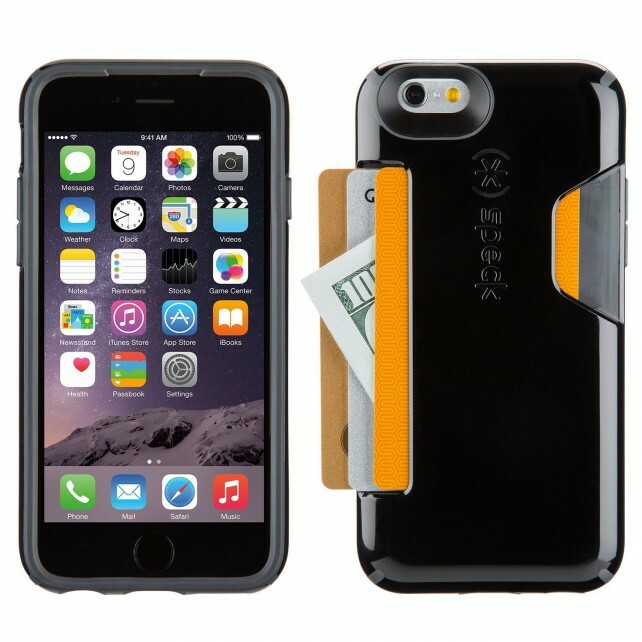 A folio-style case, Spigen’s inexpensive option has slots for a number of credit cards and a specific compartment for cash. 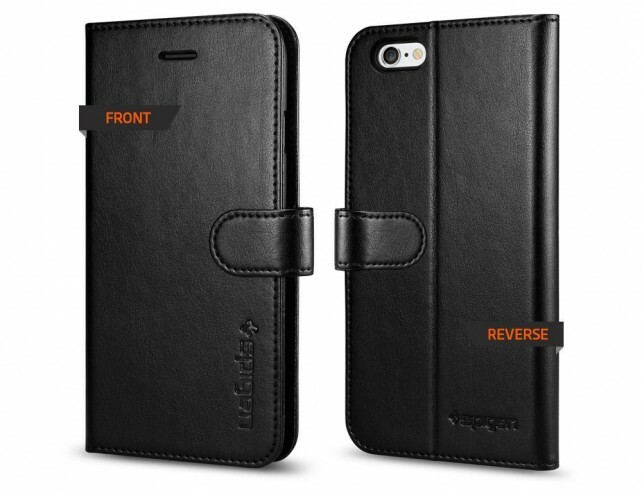 The dual-sided magnetic strap helps keep the case closed and all of the contents protected. The cover also doubles as a kickstand to place the phone in a nice media viewing angle. The black version is $14.99 while a mint or pink option costs $3 more. Handmade in San Francisco with high-quality bookbinding materials, the Lorna is beautiful and unique. Named after one of the company’s craftswomen, and just like its other products, is very stylish. The exterior is covered with Pergamena leather that is soft and luxurious to the touch. After opening the wallet, you’ll see the wallet portion of the case on the left with the a special plastic tray for the iPhone on the right. Most of the interior is made with soft book cloth material that DODOCase says is easy to clean. You can hold around six credit cards and cash. To make its contents even more secure, you can also use the elastic band closure to help keep the entire wallet shut when in a pocket or bag. You can select from three different color combinations. Each is $64.95. 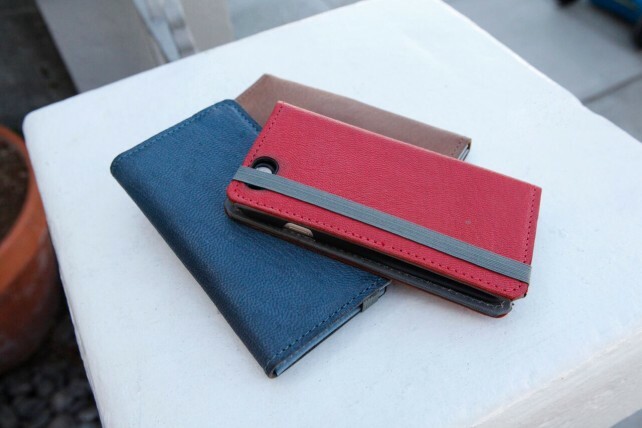 Because each case is handmade, it will ship in five to seven days after being ordered. An interesting modular choice, the Watson’s exterior – which holds cash and credit cards – can easily been removed when needed. Three slots are available for cash or credit cards. The built-in elastic band can be used to keep the wallet closed while on the go. The black version of the case is $20.99. Made with a weatherproof and durable exterior fabric, the Overture is another great folio wallet choice. The interior features a soft microfiber lining to keep your screen free of scratches. You should be able to fit around three credit cards and cash inside. It can also place your handset into a nice angle for viewing media or surfing the Web. Moshi also includes a washable screen protector that stays inside the case and can be used to keep an iPhone free of smudges and other debris. Three different color combinations are available for $44.95 each. A wallet version of Speck’s popular CandyShell line, the case is made with a softer inner layer and a harder outer shell. You can fit up to three credit cards and cash into the slide loading slot on the rear of the case. As a nice touch, a protective layer separates the wallet’s contents from the back of your handset. A black version of the case costs $25.46. It’s also available in three other color combinations that cost a bit more. Apple Stores in the U.S. are now offering machine-applied screen protectors for iPhone. 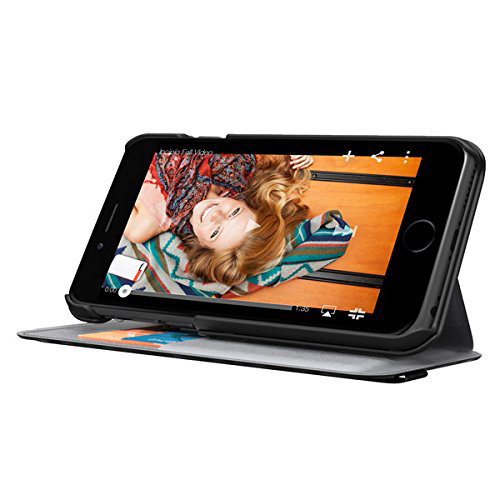 The service, which uses a Belkin protectors and the ScreenCare+ applicator tool, starts at $18 and is available for iPhone 6 and up. Apple Stores in Japan first began using Belkin’s tool to apply screen protectors last week, and now the service is available in the U.S. Thanks to the ScreenCare+ applicator, you get a flawless finish that’s free from air bumps and dust particles. The standard protector applied is made using “InvisiGlass,” which is a flexible glass technology that absorbs impact and scratches without breaking. There’s also an anti-glare option made out of scratch-resistant PET material that “enhances visibility by reducing glare from bright sunlight and artificial lighting,” according to Belkin’s ScreenCare+ webpage. Here’s a video that showcases the ScreenCare+ tool, and how it works. Belkin claims its protectors are so clear and so precise that you’ll hardly notice they are there. To get yours, simply pop into your local Apple Store. What you’re looking at here is 25-year-old Nicolas Vuignier skiing downhill while swinging his iPhone 6 around his head. The iPhone’s camera is filming here in super slow-motion, at 240 frames per second, which makes the effect look even more incredible. Vuignier hasn’t shared how he managed to film this video — he advertises a “making of” video which will teach people how to make similar contraptions. But it looks like he found a way to securely tether his iPhone to his arm, holding the phone in at least two places to maintain the phone’s upright orientation throughout the video. Definitely check out the full video below. Dropped your phone? Got it repaired anywhere other than an Apple Store? 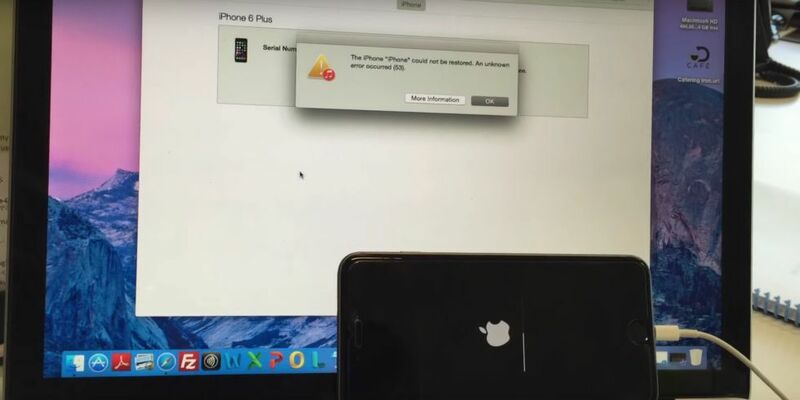 You may run into a big problem if you update to iOS 9: users are reporting a message known as Error 53 is rendering their phones useless, making the phone impossible to use. As The Guardian reports, the issue is associated with the Touch ID pad on the homescreen. 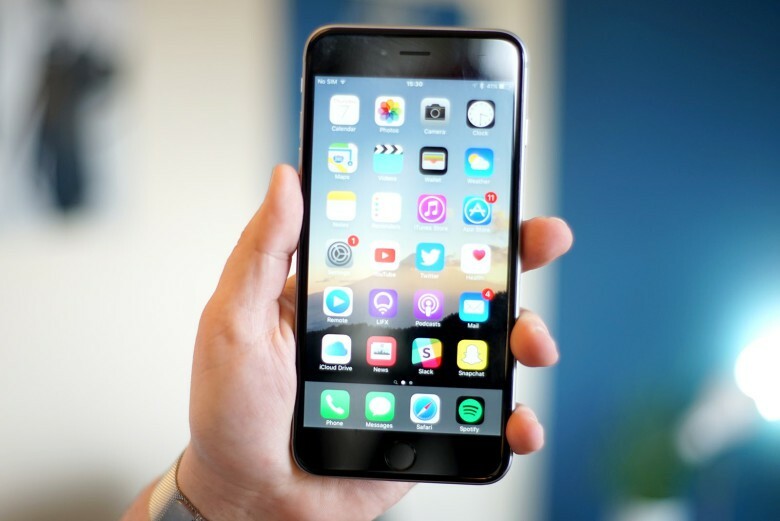 Specifically, if Apple believes it’s been tampered with, it will shut down the phone completely. Even when taken in to Apple Stores, the answer consumers have gotten back is that they need to get a new phone. This means that, at least according to Apple’s standard line, it’s to prevent tampering or anything that might compromise a user’s security. Of course, that also means that users have to stick to Apple authorized repair, whether or not there’s a place located anywhere near them that fits that bill. So yeah, if you have some home button problems on an iPhone 6 … find your nearest Apple authorized repair place or get ready to have a phone that doesn’t work. We’re an outdoorsy bunch here, and we love to feature the best in rugged gear for your iPhone. However, I’ve found that, although, I love rugged cases when I need them, I can’t stand to use them when I don’t. On the daily, I want to retain the elegance of my iPhone and add a touch of personality or class with my protective case. These iPhone cases won’t save your phone from water damage, but they’re beautiful and perfectly professional for day-to-day life. 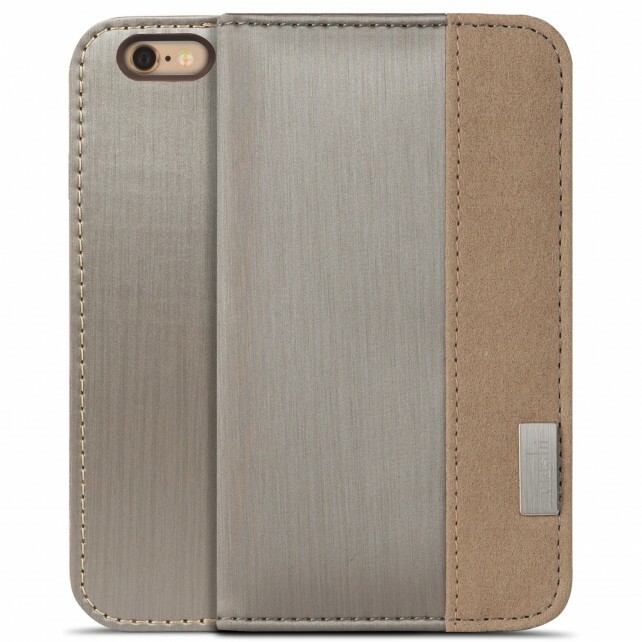 Placement for a passport is what sold me with this case for iPhone. It includes four slits for credit cards as well, making it a great option for the business professional who likes to travel light. The tan leather is gorgeous, and I love multipurpose products. Look at this beauty. 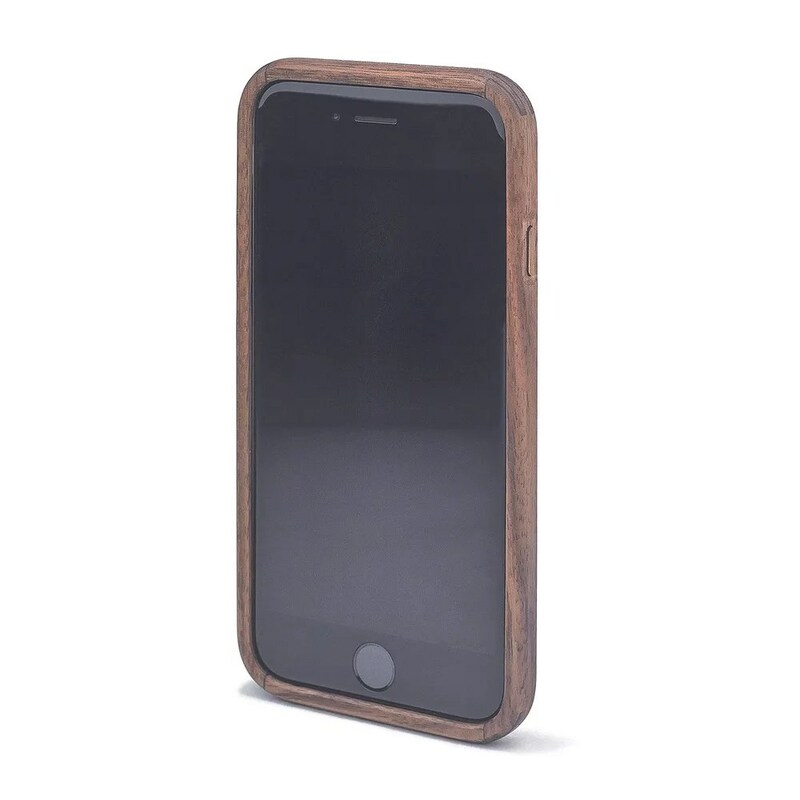 It’s an all wood, fitted case for your iPhone. They’re carved out of a single block of wood, made in Holland, and available in multiple different types of wood. Each piece is custom, so you can request specific engravings to be added. These will add a serious touch of class to any iPhone user. This shock-absorbent case with exterior card slots comes in four different color combinations. 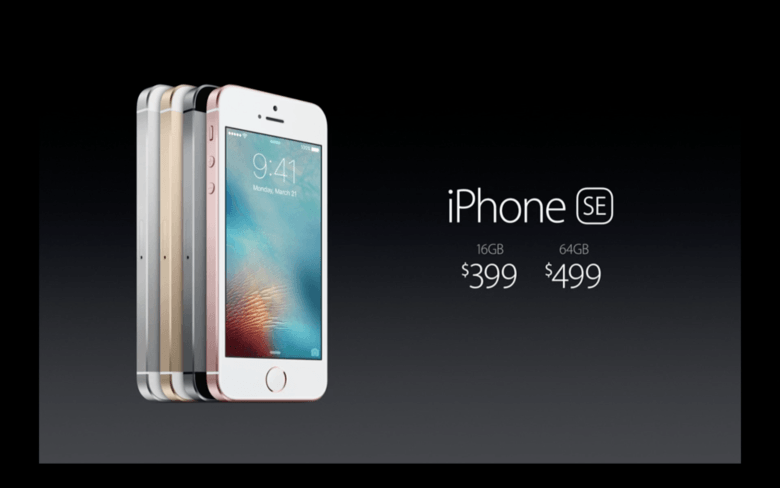 The periwinkle and gold edition caught my eye immediately. Wrapped in genuine leather, the case is a slim-fit with raised edge to protect your screen while providing a professional feel. 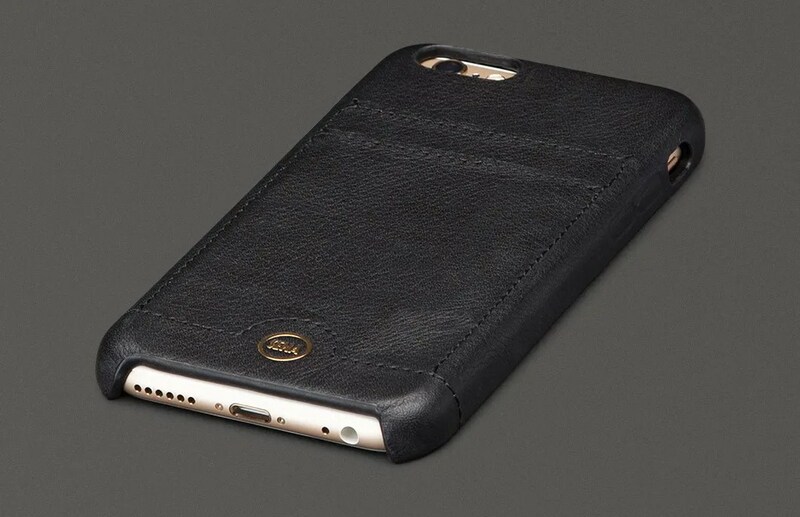 Made by Twelve South, the SurfacePad is marketed as a leather jacket for your iPhone. I’m a big fan of Twelve South’s BookBook and generally everything the company creates. 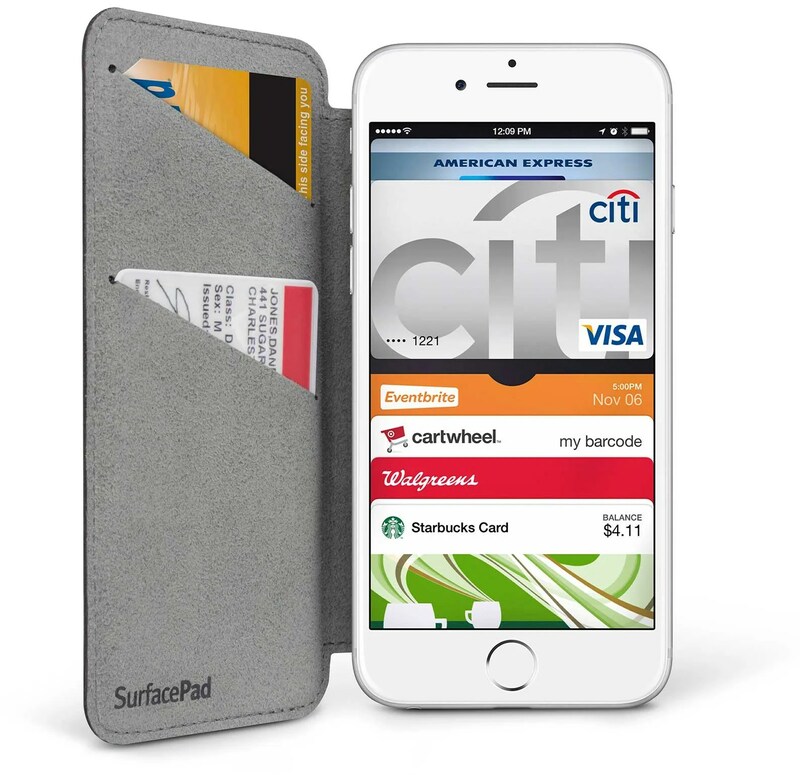 Keeping with its high standards, the SurfacePad is a leather case with suede interior that has two card slots on the internal sleeve and doubles as a simple stand. Uniquely, the iPhone attaches with a SurfaceGrip modern adhesive, meaning you won’t have to pop it in and out. If you appreciate an iPhone sans case but want to cover the edges beautifully. This minimalist case leaves the front and back of the iPhone exposed while creating a bumper around the edges for style and protection.